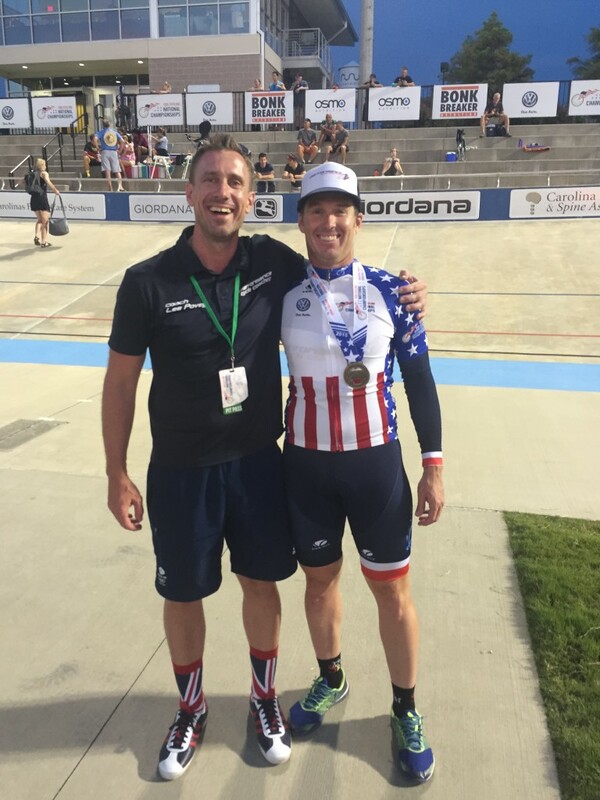 After a few years of reasonable success on the road (criteriums) and mass-start track events, I started with Lee and PCC in the fall of 2014 with the intent of a full focus on track sprinting and a target of success at Masters Nationals. In hindsight, I had no idea what I was getting into and had to unlearn a number of things to transition into being a “real sprinter”. Most notably, I generally rode my bike way too much, but not nearly enough “really fast”. Lee put me on a full weights program, a first for me since my collegiate swimming career 20 years ago. I spent much more time at the track, most of it sitting in the infield. Coming from road training, the idea that a workout could consist of “4 flying 100s with 20 minutes rest” just didn’t compute for me. I spent the first few months telling Lee I needed more volume. He spent the first few months telling me (politely) to “stick with the bloody program” or some other quasi-coherent British phrase. We progressed pretty well through the early season, I got stronger, better positioned on the bike, and actually learned how to ride a proper 200 and a match sprint. Early season benchmarks looked good and by our first sprint clinic in April, I was getting fast and put up a F200 PR by a couple tenths. At the May clinic I improved my 200 by another 2 tenths; now nearly a half second faster than previous best. In June, we headed down to Carson for some indoor track time and electronic timed efforts. We had a good effort in the Team Sprint; I trimmed another tenth off my 200 (ever closer to the magic “10.99”), and posted a PR in the kilo despite an only marginal execution. Going into Masters Nationals I had big goals and was heaping lots of pressure on myself. The schedule in the 40+ age group was good for me: Wednesday Match Sprint, Friday Kilo, and Sunday Team Sprint. Lee staked out prime real estate for the PCC crew and made sure we were well stocked with ice bags to compete with the oppressive heat. The Match Sprints went well. I qualified 1st and posted a PR in the F200. The next 9 hours were really long and challenged me mentally way more than I anticipated; getting prepped for 7 matches was tough and something I’d not done before. The round 1 and quarterfinal rides went smoothly and I was through to the semi’s in the evening session. In the semis I had a good ride1 but rode a tactically poor ride2 and only came out on top due to more raw power. In the final I was up against a previous national champion and definitely nervous. Lee settled me down and reminded me that I had 2 tenths in hand from qualifying and that my road background would give me some edge at the end of a long hot day of efforts. Ride1 went as planned; take the front and gradually build the speed while keeping my opponent from getting a height advantage by getting to the rail. Ride2, jersey just 750m away. I started at the rail with my opponent below. Lee and I had watched his tactics through the early rounds and expected him to try to keep it slow and pin me on the rail. If possible, the plan was to take the 1st opportunity to come underneath and take the lane. As expected, in the back straight he turned up track to take me to the rail and I immediately went underneath into the sprinters lane and started building speed. He made a couple attempts to gain the height advantage but I was watching closely and accelerated to force him back down. As we rode through 3&4 going into the bell lap, he again tried to get some elevation and I went all out, ~300m between me and the line. It was early but my opponent allowed a bit too much of a gap to develop before fully committing to the chase and he was never really able to get into the draft and rush the gap. I crossed the finish line with a clean set of wheels and my first National Championship! This was my first “real” sprint tournament and I was not fully prepared for the stress and duration involved. Having Lee on the scene handling countless details I’d have overlooked and knowing my strengths and limits was hugely beneficial. After a successful sprint tournament, I was feeling pretty good about the Kilo. Everything went according to plans, with one minor hiccup. I was riding in the last heat, and figured that my closest competition would be in the last three or four heats. However, in one of the early rounds, the announcer read off a 1:06! For a few minutes everyone in the warm-up circle figured the race was for 2nd at that point. Fortunately, a few heats later the announcer corrected the early mistake. Going into my heat, the best time was 1:09.9; right at my PR from LA several weeks earlier. I clocked a PR by a full second and finished at 1:08.7. I still had a stint in the hot seat, despite being the last heat, as there was a re-ride from an earlier mechanical before I was able to celebrate my 2nd jersey. I was really wrecked after this Kilo, worse than any I can remember. As I was lying in the shade cradling a bag of ice, my “chaperone” for the drug testing turned up and shadowed me until I got myself sorted out and to the testing trailer. The last day at Master’s Nationals is Team Day; team pursuit, team sprint, and madisons. I was riding with the same boys from last year’s nationals in Seattle where we came a heartbreaking 2nd. Ken, Ethan, and I trained together frequently since last summer and we were all markedly faster and our team execution improved. On paper, we were the fastest trio in the event, but you still have to execute and ride clean. The pressure was pretty high; the three of us really wanted to win this one. After much debate, we lined up in the same order as Seattle; Ken, Ethan, and me as man3. As with my Kilo, we the last heat but there was a mechanical and re-ride to follow us so we’d have a bit of waiting even with a great ride. The countdown goes, we go on the BEEP, and then hear the gun fire. False start charged to the front straight. Oops, now the pressure is even higher and we need to be conservative on the start. We line up and go, clean start, and Ken is flying. Ethan takes over for lap2 and adds some MPH; it is seriously hard to follow him and I am going pretty much all out even before Ethan pulls up and leaves me to lap3. I cross the finish line at the end of my lap and stop the clock at 49.6, a tenth better than we did in LA in June and 1.3s under the next best time. We waited for one last team to finish their re-ride before celebrating our win. Lee’s PCC sprint boys brought home 7 jerseys among the three of us, a total sweep of the 35-44 sprint events. The season wrapped up with a quick trip down to LA to ride the Team Sprint at Elite Nationals. After pouring over the splits and powermeter data, we decided to shuffle the order and have me ride man2 and Ethan finish it off. We put together a solid ride; 7 tenths faster than Rock Hill in the prelims to qualify 4th and earn a 2nd ride that evening. We really wanted to come home with the podium finish at the big show. We rode faster in final that the qualifier, but the LA boys we were up against in the bronze final went a full second faster than their prelim ride and outpaced us. We settled for 4th, not a bad showing for a trio of old guys at their 1st elite nationals, but we’ll be back for the podium next year! Huge thanks to coach Lee for the tireless support and to my teammates Ken and Ethan for pushing me to be faster every time we got on the track.